Echo’s Introduction: Hey there! 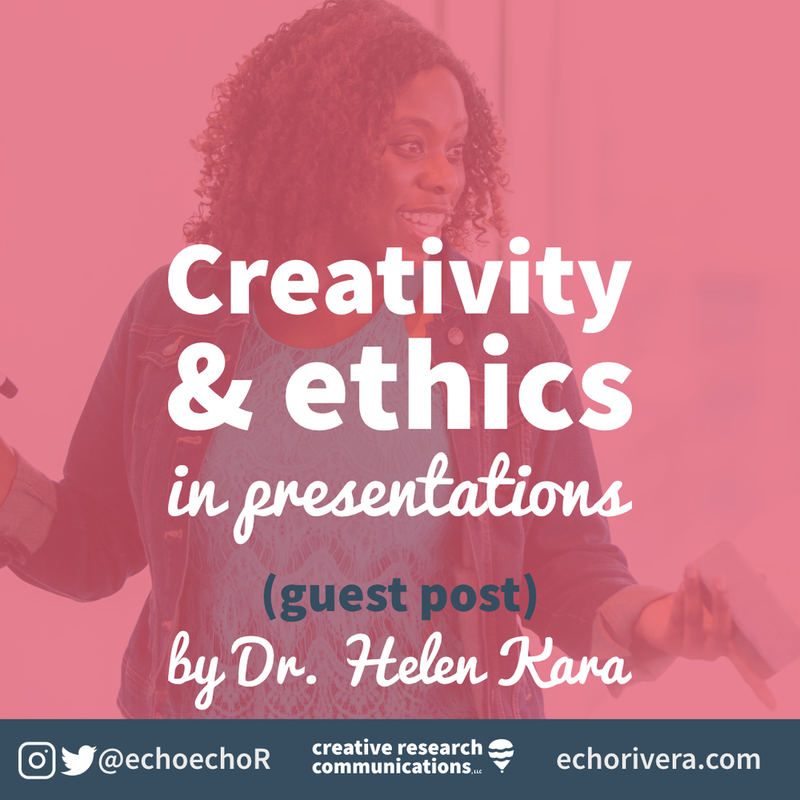 I invited Dr. Helen Kara to write a guest post on my blog because she wrote a book on Creative Research Methods (something I wish I had in grad school!) and has a great perspective on bringing creativity into the research process. Enjoy! I feel honoured to be able to contribute to Echo’s marvellous blog. I’m not a very visual person and I have learned a lot from her work; my slides are definitely better than they were before. I never really thought about the importance of font size, colour, slide design, and all the different decisions that go into making slides compelling rather than repellent. I guess that, even though I’ve written a book on creative research methods, I didn’t realise how much creativity could go into making a slide deck. My PowerPoint slides still have plenty of room for improvement, but now I get a compliment on them from time to time and that never happened before I implemented some of Echo’s suggestions. Previously, I had considered the more performative aspects, and the ethics, of presentations. Every presentation is to some extent a performance, and performances are created. In my view, creativity and ethics are closely linked – and indeed there is some empirical evidence for the link between creative and ethical thinking. Creative and ethical presentations are also linked to quality in research. In a much-cited paper, the American researcher Sarah Tracy proposes eight criteria to assess the quality of qualitative research. One of these is ‘resonance’, i.e. presentation that is aesthetic and evocative and so has an impact on its audience. Clearly a slide deck alone, however well designed, is unlikely to achieve this. At the minimum, good narration is needed to accompany slides in an online presentation. In a more recent article, Lucy Pickering and I argue for an ‘ethics of engagement’ when presenting research. Again at the minimum, this means making eye contact with your audience and not reading out your slides. Now academics are increasingly drawing on arts-based methods of presenting work such as poetry, drama, song and dance. For example, the sports researcher Kitrina Douglas has written songs to present her research findings. Education researcher Cate Watson wrote a drama script about her findings and asked conference audience members to volunteer for roles. Dance Your PhD, a global competition for natural and social scientists, began 10 years ago with just 12 contestants; by last year that had increased more than fivefold. On the plus side, creative presentations help audiences understand and retain more of the information you’re trying to convey, by engaging people’s emotions as well as their cognition. There is now a body of evidence to show that we are more likely to remember experiences that make us feel as well as think. It is good practice to do all we can to help our audiences understand and remember the information we have to share. The logical conclusion here is that there is an ethical imperative on researchers and academics to present our work in engaging ways. Some people love this idea. Others find it terrifying. If you’re one of the latter: don’t panic. Even small creative elements can add a great deal to a presentation. You could play some music from your phone; write a haiku; dress up as a different character. There is no need to learn new skills. Think about what you can already do, make, or acquire that would enhance your presentations. Then give it a go. The quality of your presentations will improve and your audiences will be grateful. Dr Helen Kara has been an independent researcher since 1999 and writes and teaches on research methods. She is the author of Creative Research Methods in the Social Sciences: A Practical Guide (Policy Press, 2015). She is not, and never has been, an academic, though she has learned to speak the language. In 2015 Helen was the first fully independent researcher to be conferred as a Fellow of the Academy of Social Sciences. She is also a Visiting Fellow at the UK's National Centre for Research Methods. Her latest book is Research Ethics in the Real World: Euro-Western and Indigenous Perspectives (Policy Press, 2018).